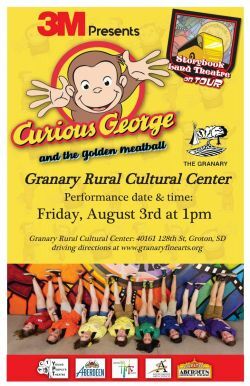 goes on the road with its production of "Curious George: The Golden Meatball!" while the SBLT performers entertain you with this children's classic. Fun for all ages! The Granary staff encourage you to bring a lawn chair or blanket to sit on. The Granary galleries will be open and beverages will be available for sale. Aug 3, 2018 1:00 pm - 3:00 pm Come early for parking and to visit the Granary galleries. 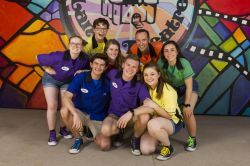 The Storybook Land Theatre performs at the Granary Rural Cultural Center on Friday, August 3 at 1pm.